Crocodile is a predatory and dangerous animal, which feels great in two elements: earth and water. The crocodile means gluttony and destructive force in the culture of Western countries. The animal symbolized a rebirth in African countries. Africans called the scars of boys after circumcision with crocodile marks. It was believed that the reptile swallowed the boys, who then degenerated into the men. The crocodile was painted with an open mouth, into which the sun sets every evening in tribes of Indians. So it was identified with the helper of the gods. A hypocritical person was compared to a reptile in European countries. A predator was associated with a guide to different worlds in India: the afterlife and the world of life. Despite some differences in the interpretation of the meanings of crocodile tattoos in various cultures, this reptile has always inspired people with fear and danger. It was revered at the same time, especially in the countries of direct habitation. In addition, the crocodile is depicted on the arms of some countries and symbolizes power and strength. 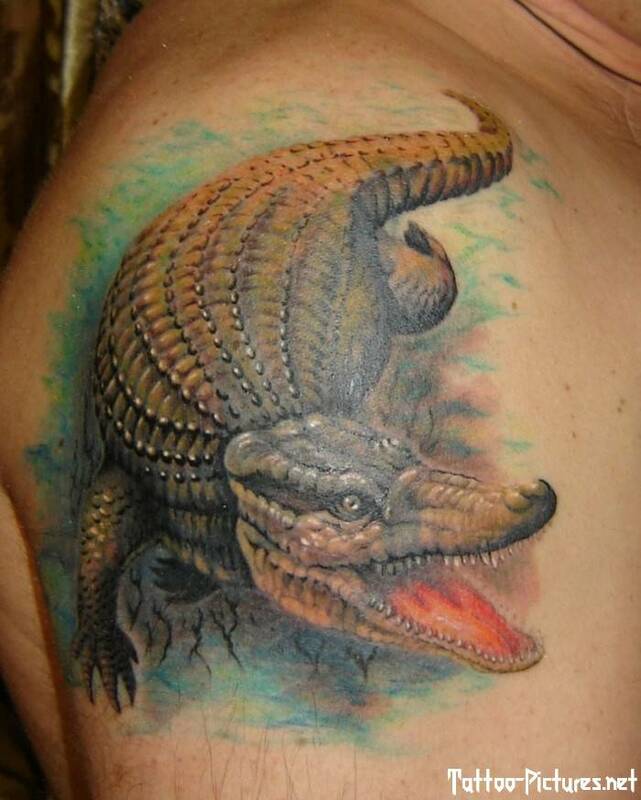 A person who decided to make a tattoo with a crocodile or alligator image should have such qualities as self-confidence, purposefulness, strength, stiffness, perseverance. That’s why this tattoo is so popular among athletes and leaders. In addition, it is often found among criminal authorities. A woman can also make a picture of a crocodile, but it will be treated quite differently. In this case, tattoo means motherly love, care and protection, purposefulness and creativity. The image of a crocodile with open mouth means the desire to live in this world, regardless of the danger and obstacles. To go not with the flow, but against it. The meaning of a crocodile tattoo with closed eyes suggests that its owner is not as simple as it might seem at first sight and is able to stand up for itself. It is known that reptiles with closed eyes still perfectly see and do not miss a chance to attack their victim, who does not suspect that the animal is awake. HOW AND WHERE SHOULD IT BE INKED? 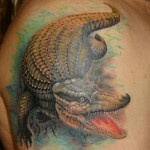 A crocodile or an alligator picture is applied to any part of the body. It all depends on the size of the picture, style of application and individual wishes. The animal is depicted with an open or closed mouth, asleep or awake, in color or monochrome. Every detail matters, so the customer chooses a sketch of a crocodile tattoo that correctly reflects his temperament and character.